Clackmannanshire and Stirling Adult Support and Protection Committee’s programme of Professional Development Seminars are designed to enhance knowledge and skills and thus influence practice improvement – they are not formal training and are intended to raise awareness of topical issues. The content of the ASP seminars is influenced by emerging issues within the Health and Social Care Partnership. 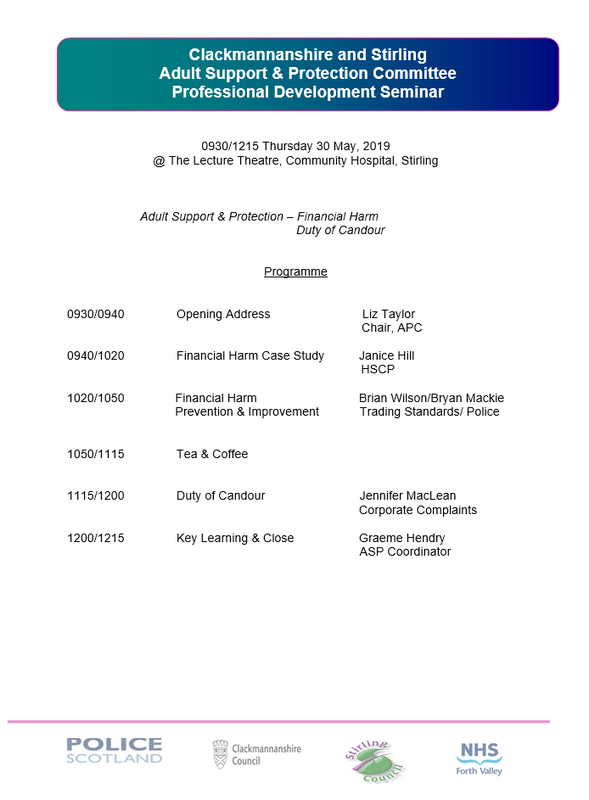 The next ASP seminar is scheduled to be held between 0930 and 1215hrs on Thursday 30 May, 2019 within the Lecture Theatre, Community Hospital, Stirling and will consist of presentations on a financial harm case study, prevention of financial harm and finally Duty of Candour. Emails expressing intention to attend are to be sent to Margaret MacFarlane at ssld@clacks.gov.uk. Please advise Margaret if there are any special requirements which need to be considered.